At 9:45am, dark gloomy wet weather outside the house while everybody still cozying up on the bed with thick warm blanket, Karzan starts bark. Barks like crazy. Everybody dragging themselves up to see what happen. We open the door, we saw a man holding a big package with caution sticker all over. The man smiled and said, this is very expensive and good. Of course it's the 1999 Eden Valley Hill of Grace from Henschke that Frances bought over a week ago. 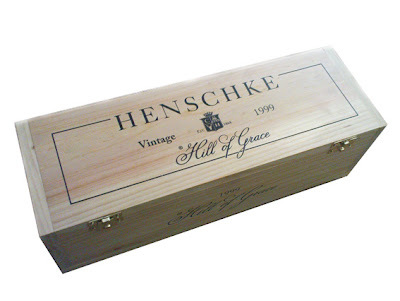 The Hill of Grace is one of the most prominent red wines in Australia and is the flagship wine of Henschke. It is 100% Shiraz, which is a full-flavored red wine that goes well with strong tasting meats such as beef, lamb, goose or duck. 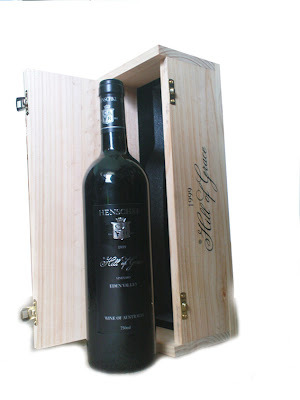 The particular vintage comes after the famous 1998 vintage, the best vintage on record for South Australian shiraz. The tasting notes can downloaded from the Henschke web site and states the optimum drinking year as 2014... which means 5 more years of painful cellaring. Why would we have it? The story goes like this. For a while now, Joe has turned into a person who appreciates wine. He regularly buys wine from the better wine shops around Perth and does considerable research online. 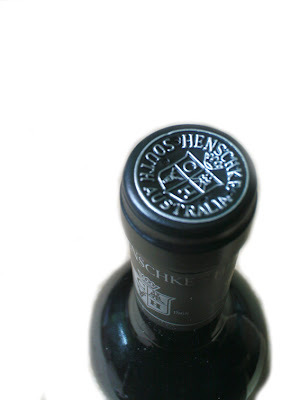 Most of the expensive Australian wines are typically out of reach for regular wine consumers like us, with the flagship wines of Penfold, Wild Duck Creek, Green Nock Creek, Moss Wood, Henschke etc. all costing well over $200 up to $600 depending on the particular vintage. While they are all definately good wines, its debatable as to weather its worth that much. Well, we'll let you know in 5 years. Tune in in 2014 for an update for how it tastes. its mind blowing looking at the price. i gotta give it to you guys..
Happiest Day! Thanks Nuffnang! and Tax Refund!